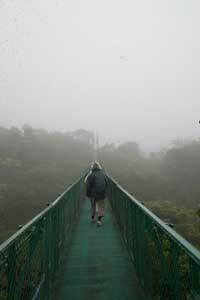 Today it was off even higher into the cloud forest that is Monteverde, this time for a walk through the tree “canopy”, 150 feet about the ground across a series of suspension bridges. On this day the “cloud mist” coll aborated with bona fide rain, to make for a pretty squishy walk in the woods. The slippery metal suspension bridge platforms were no picnic, either. 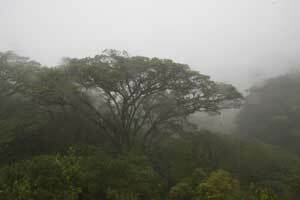 We did, however, get a chance to see some very “atmospheric” scenes of huge trees shrouded in fog at the top, with leaves glistening from the rain below. Those shots come at a price, however; my camera needed part of the next day to “de-fog” and get all the excess moisture out of its system. Following the canopy walk we split up into small groups, with the most intrepid/adventurous (foolhardy?) of the group choosing to zipline for about a mile through twelve treetop stations, 150 feet up, in 50-ish degree weather and a steady, drenching rain. The more sane among us went off to visit the reptile museum (where it was dry inside – yea!) and/or to immerse oneself in a hummingbird melee. Hundreds of hummingbirds of every shape, color and size assemble here at various feeders, more or less oblivious to the humans stationed all around them, madly snapping photos of their feeding activities. In the afternoon it was back to our mountainside retreat, to dry out, have lunch, chill for a while, and visit the local town for souvenirs and excitement. And prepare for a 6 AM departure from the hotel, sans coffee or breakfast, for our trip to Tortuga Island and beach time.